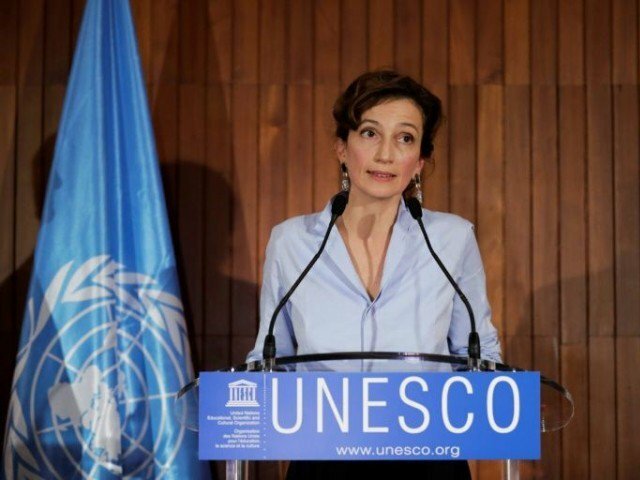 French former culture minister Audrey Azoulay was elected to head UNESCO at a time when the UN cultural agency is under the cloud of Gulf tensions and accusatons of anti-Israel bias. PARIS: French former culture minister Audrey Azoulay was named to head the UN’s embattled cultural agency on Friday, beating her Qatari rival after a politically charged contest clouded by Gulf tensions and accusations of anti-Israel bias. The campaign to succeed UNESCO’s outgoing chief Irina Bokova was overshadowed by Washington’s announcement Thursday that it planned to withdraw from the Paris-based body after years of tensions over decisions seen as critical of Israel. “In a time of crisis, we need more than ever to get involved (and) work to strengthen the organisation,” Azoulay said after the final vote. Azoulay, who will become UNESCO’s second woman leader after Bokova, had edged out Egyptian rights activist Moushira Khattab earlier Friday as the main challenger to Al-Kawari, the frontrunner until the final run-off. Azoulay’s nomination must be approved by the agency’s 195 member states on November 10, a vote that has never previously gone against the board’s nominee. Egypt is part of the coalition led by Saudi Arabia that has been blockading strategically placed Qatar since June over its alleged support for radicals and its ties to Iran. Lebanon’s candidate Vera El-Khoury, who bowed out at the fourth round of voting, told AFP that the power game at play in the race had shown UNESCO members “did not give a damn” about the candidates’ programmes. UNESCO is best known for its World Heritage sites including tourist favourites such as the Grand Canyon or Cambodia’s Angkor Wat, but it also runs science, media training and cultural programmes internationally with an annual budget of about $250 million (210 million euros). The US decision to withdraw, which is to take effect on December 31, 2018, underlined America’s drift away from international institutions under President Donald Trump. French former culture minister Audrey Azoulay was named to head the UN’s embattled cultural agency on Friday, beating her Qatari rival after a politically charged contest clouded by Gulf tensions and accusations of anti-Israel bias.